I’m a Wes Anderson fan, but not a good Wes Anderson fan. I still haven’t gotten around to MOONRISE KINGDOM or DARJEELING LIMITED. So it’s hard to say you are a fan of a guy when you haven’t seen two of the four movies he has done over the past seven years. But I am saying it anyway. Regardless, I finally got to the theater to see GRAND BUDAPEST HOTEL. I watched GRAND BUDAPEST HOTEL (2014) in theaters on 4.9.14. It was my first viewing of the film. In another half a century or so someone will set out to make a new documentary on the history of film. When considering the first couple decades of the 21st century, it is hard to think that Wes Anderson won’t get a good amount of time devoted to his work. There are other major directors working today, of course. There are fewer auteurs than there were in days past due to the oversight of producers and studios. Even among the major directors there is, perhaps, nobody with a style more identifiable and defined than Wes Anderson’s. The boxy edges of the frame matter as much as the normal focus of the frame. Anderson uses color to make or undermine points. He uses the corners of the frame to introduce a character’s head, or a neat piece of scenery as a way of reminding us that all of this is, indeed, a movie. The matte paintings are intentionally obvious. Characters fully cross the plane of the shot, entering one end and exiting another. Often they re-enter the same shot and head in the opposite direction. Stillness is used as much as movement. Tracking shots will reveal a punchline or… nothing at all. 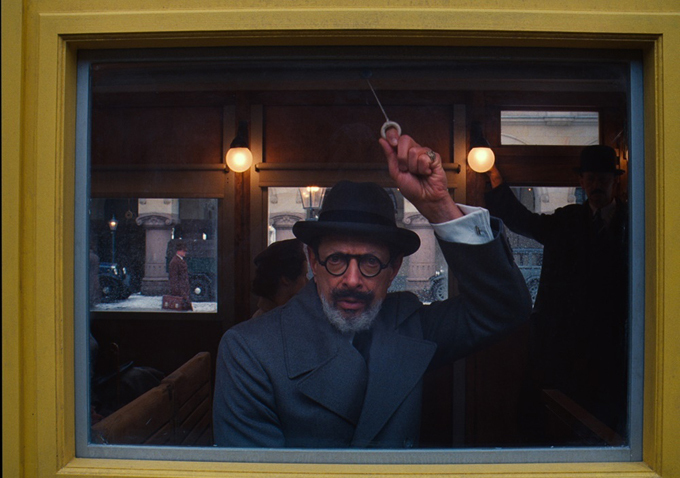 Anderson brings this visual punch to GRAND BUDAPEST HOTEL, of course. The story begins with someone reading a book of an older writer (Tom Wilkinson) telling a story of their younger self (Jude Law) being told a story by an old man, Moustafa (F Murray Abraham). Most of the story, then, involves the young Moustafa (Tony Revolori) as his tenure as a lobby boy begins at the Grand Budapest Hotel. He is swept under the wing of the suave and efficient Gustave (Ralph Fiennes) who seamlessly gets himself into a deal of trouble, but calmly steps out of it as easily. Gustave is set to inherit a good deal of money from a former guest and mistress Madame D (Tilda Swinton). Her family, led by her son (Adrien Brody) and a henchman (Willem Dafoe) set Gustave up and he ends up in jail. Craziness ensues… or continues to ensue. This quick wrap up doesn’t even mention other Anderson regulars who make appearances. Guys like Bill Murray, Jeff Goldblum, Ed Norton, Harvey Keitel, Jason Schwartzman, and Owen Wilson all show up for a few minutes each and contribute a moment in the sun. What makes the movie tick, however, is the relationship between the young Zero Moustafa and his mentor Gustave. They light the screen up with witty banter and wonderful optimism. When Zero begins to like a girl, Agatha (Saoirse Ronan), Gustave becomes both father and latent rival. Zero doesn’t take it too seriously, but has to warn Gustave off several times. The fact that the relationship is a true friendship is at the heart of what makes the movie work. When Gustave rails at Zero for messing something up he truly feels guilty afterwards. Gustave has had many relationships over his life and career, but very few friendships. Death, as always for Anderson, is a major theme here. In GRAND BUDAPEST the death is a bit more violent and aggressive than it has been in some of his quieter movies. He treats death like another piece of humor. Nobody ever gets all that upset about death because it gets in the way of life. The story of what happens to Agatha undermines this idea somewhat, as Zero obviously never truly has moved past her demise despite the flippant way in which he mentions her passing. 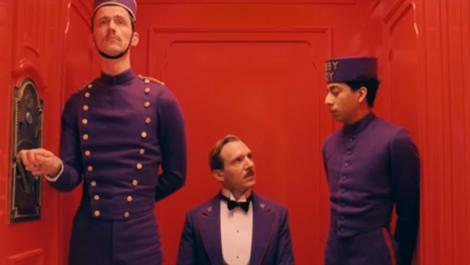 GRAND BUDAPEST may not be Anderson’s most entertaining work. Yet, no doubt, it is another step in the solidification of his particular aesthetic. The story is tight, the characters are memorable, the comedy is both simple and sophisticated. It is a complete and consistent work in the sense that Anderson does all it would seem he sets out to do. This is a movie which certainly will live in the upper echelon of his canon. ~ by johnlink00 on April 10, 2014.